Outbound Automation by boberdoo gives you dozens of options to optimize your sending practices and monetize your contacts. Beyond the basic features, there are several ways you can use the system to get the absolute most out of your outbound marketing practices. We call these our Best Practices. Click the features below to expand the details. Utilizing multiple 3rd party ESPs is one of the biggest benefits of Outbound Automation. By sending via multiple ESPs, you have the ability to track your deliverability rates from each ESP to each ISP (email client) and adjust your sending percentages accordingly. Additionally, integrating your system with multiple ESPs allows you to set up failover measures in the event that one of your ESPs fails to send. Setting up multiple ESPs is simple. Take a look at our ESP integration articles to learn how. If you are utilizing multiple 3rd party ESPs, we highly recommend that you set up a failover ESP for each of your campaigns. In the event that your primary ESP(s) hits a daily/monthly limit or fails to send for any reason, your failover ESP will pick up the load and continue sending your campaign. How To Set It Up When setting up a campaign, you have the ability to add a failover ESP for each event you create. After building your email and selecting an Event Trigger, select two or more ESPs to send with and click Next Step. Next, specify your ESP/ISP sending allocation percentages. To designate a failover ESP (the ESP that will send should your primary ESP(s) fail to send), simply leave its sending percentages to 0%. As you can see from the example below, Amazon SES is serving as the primary ESP and Sendgrid is serving as the Failover ESP. To help you manage your sending totals from each of your ESPs, we highly encourage you to take advantage of the Daily Send Limit found for each of your ESPs in the Outbound Automation Setup page. Once your Daily Send Limit is set, your system will keep track of your emails sent from your ESP from midnight to midnight each day and ensure your sending does not exceed your designated value. Once your Daily Send Limit is reached for a specific ESP, that ESP will 'fail' and attempt to send any additional emails using your campaign's failover ESP if you have one set up. If you're including a phone number anywhere in your email creatives, whether it is in the body of the text, a clickable button or even an image, we highly encourage you to utilize click to call links. Here's how to do it. 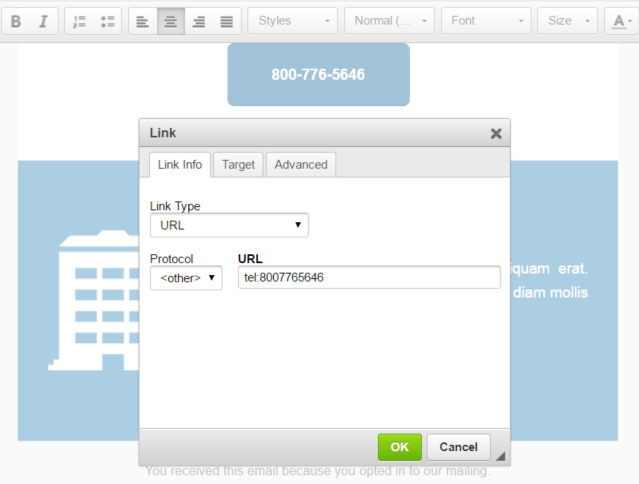 In the email body editor within Outbound Automation, use the link tool for the text or image you would like to enable click to call for. Next, change the Protocol to other. Finally, add your phone link in this exact format: tel:5555555555 Your click to call link is now set up. When a mobile user clicks this link, they will be prompted to dial your specified number.